The liver and nearby organs. 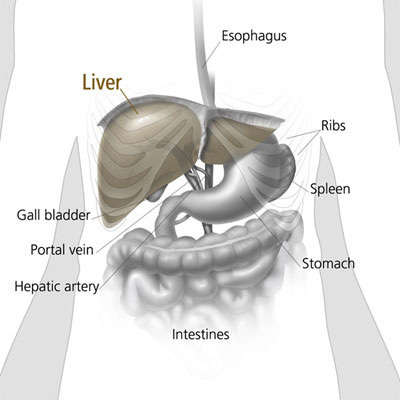 Cancer that begins in the liver is called primary liver cancer and is not common in the West. However, it is common for cancer to spread to the liver from the colon, lungs, breasts, or other parts of the body. When this happens, the disease is not liver cancer. The cancer in the liver is a secondary cancer. It is named for the organ or the tissue in which it began. Most primary liver cancers begin in hepatocytes (liver cells). This type of cancer is called hepatocellular carcinoma or malignant hepatoma. Children may develop childhood hepatocellular carcinoma or hepatoblastoma. This article does not deal with childhood liver cancer. When liver cancer spreads (metastasizes) outside the liver, the cancer cells tend to spread to nearby lymph nodes and to the bones and lungs. When this happens, the new tumor has the same kind of abnormal cells as the primary tumor in the liver. For example, if liver cancer spreads to the bones, the cancer cells in the bones are actually liver cancer cells. The disease is metastatic liver cancer, not bone cancer. It is treated as liver cancer, not bone cancer. The liver is the largest organ in the body. It is found behind the rib-cage on the right side of the abdomen. The liver has two parts, a right lobe and a smaller left lobe. The liver has many important functions that keep a person healthy. It removes harmful material from the blood. It makes enzymes and bile that help digest food. It also converts food into substances needed for life and growth. The liver gets its supply of blood from two vessels. Most of its blood comes from the hepatic portal vein. The rest comes from the hepatic artery. Who is at risk from lung cancer? Researchers in hospitals and medical centers around the world are working to learn more about what causes liver cancer. At this time, no one knows its exact causes. However, scientists have found that people with certain risk factors are more likely than others to develop liver cancer. A risk factor is anything that increases a person's chance of developing a disease. Chronic liver infection (hepatitis). Certain viruses can infect the liver. The infection may be chronic. (It may not go away.) The most important risk factor for liver cancer is a chronic infection with the hepatitis B virus or the hepatitis C virus. These viruses can be passed from person to person through blood (such as by sharing needles) or sexual contact. An infant may catch these viruses from an infected mother. Liver cancer can develop after many years of infection with the virus. These infections may not cause symptoms, but blood tests can show whether either virus is present. If so, the doctor may suggest treatment. Also, the doctor may discuss ways of avoiding infecting other people. In people who are not already infected with hepatitis B virus, hepatitis B vaccine can prevent chronic hepatitis B infection and can protect against liver cancer. Researchers are now working to develop a vaccine to prevent hepatitis C infection. Cirrhosis. Cirrhosis is a disease that develops when liver cells are damaged and replaced with scar tissue. Cirrhosis may be caused by alcohol abuse, certain drugs and other chemicals, and certain viruses or parasites. About 5 percent of people with cirrhosis develop liver cancer. Aflatoxin. Liver cancer can be caused by aflatoxin, a harmful substance made by certain types of mold. Aflatoxin can form on peanuts, corn, and other nuts and grains. In Asia and Africa, aflatoxin contamination is a problem. However, the U.S. Food and Drug Administration (FDA) does not allow the sale of foods that have high levels of aflatoxin. Being male. Men are twice as likely as women to get liver cancer. Family history. People who have family members with liver cancer may be more likely to get the disease. Age. In the United States, liver cancer occurs more often in people over age 60 than in younger people. The more risk factors a person has, the greater the chance that liver cancer will develop. However, many people with known risk factors for liver cancer do not develop the disease. People who think they may be at risk for liver cancer should discuss this concern with their doctor. The doctor may plan a schedule for checkups. These symptoms are not sure signs of liver cancer. Other liver diseases and other health problems can also cause these symptoms. Anyone with these symptoms should see a doctor as soon as possible. Only a doctor can diagnose and treat the problem. Physical exam. The doctor feels the abdomen to check the liver, spleen, and nearby organs for any lumps or changes in their shape or size. The doctor also checks for ascites, an abnormal buildup of fluid in the abdomen. The doctor may examine the skin and eyes for signs of jaundice. Blood tests. Many blood tests may be used to check for liver problems. One blood test detects alpha-fetoprotein (AFP). High AFP levels could be a sign of liver cancer. Other blood tests can show how well the liver is working. CT scan. An X-ray machine linked to a computer takes a series of detailed pictures of the liver and other organs and blood vessels in the abdomen. The patient may receive an injection of a special dye so the liver shows up clearly in the pictures. From the CT scan, the doctor may see tumors in the liver or elsewhere in the abdomen. Ultrasound test. The ultrasound device uses sound waves that cannot be heard by humans. The sound waves produce a pattern of echoes as they bounce off internal organs. The echoes create a picture (sonogram) of the liver and other organs in the abdomen. Tumors may produce echoes that are different from the echoes made by healthy tissues. Magnetic resonance imaging (MRI). A powerful magnet linked to a computer is used to make detailed pictures of areas inside the body. These pictures are viewed on a monitor and can also be printed. Angiogram. For an angiogram, the patient may be in the hospital and may have anesthesia. The doctor injects dye into an artery so that the blood vessels in the liver show up on an X-ray. The angiogram can reveal a tumor in the liver. Biopsy. In some cases, the doctor may remove a sample of tissue. A pathologist uses a microscope to look for cancer cells in the tissue. The doctor may obtain tissue in several ways. One way is by inserting a thin needle into the liver to remove a small amount of tissue. This is called fine-needle aspiration. The doctor may use CT or ultrasound to guide the needle. Sometimes the doctor obtains a sample of tissue with a thick needle (core biopsy) or by inserting a thin, lighted tube (laparoscope) into a small incision in the abdomen. Another way is to remove tissue during an operation. Read about how liver cancer is treated.